The San Francisco Mime Troupe will open their 58th Season with WALLS, written by Michael Gene Sullivan with music and lyrics by Michael Bellow.The San Francisco Mime Troupe creates and produces socially relevant theatre of the highest professional quality and performs it before the broadest possible audience. SFMT makes sense of the headlines by identifying the forces shaping our lives and dramatizing the operation of these giant forces in small, close-up stories that make audiences feel the impact of political events on personal life. 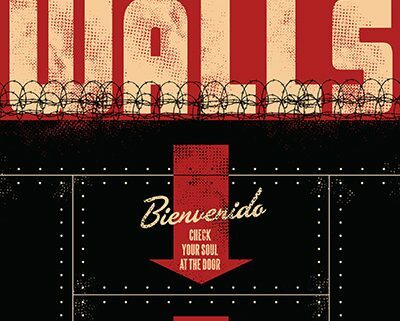 WALLS asks the question: How can a nation of immigrants declare war on immigration? The answer: FEAR! Mary Jones (Velina Brown) knows all about fear. As a top agent for I.C.E. – Immigration and Customs Enforcement – she knows how to stoke fear to keep her country safe. Fear of people like Bahdoon Samakab (Rotimi Agbabiaka),a Somali refugee escaping oppression, fear of Cliodhna Aghabullogue (Lizzie Calogero),an Irish woman yearning to be American, and fear of Zaniyah Nahuatl (Marilet Martinez), whose family comes from… here. As a foreigner in a land her people have worked for thousands of years suddenly Zaniyah is a criminal, an illegal, a “bad hombre.” What part of herself will this American give up to pass as “American?” Will she? Can she? Should she? Can someone leave part of themselves behind without losing their mind? And is it better or worse that she crossed the border to find Agent L. Mary Jones – the woman she loves?